Damiana (Turnera aphrodisiaca) is a medicinal herb used to increase sexual desire because of the agent aphrodisiac that is found in it and this plant is currently used as a general tonic for the nervous, hormonal, and reproductive systems. In Jamaica it is known as "ram goat dash along" and others refer to it as "ram goat national." This is due to the fact that goats love to eat this plant and it is believed that it is the reason for the goats rapid breeding. It is grown almost everywhere in Jamaica. It is native to southwestern Texas in the United States, Central America, Mexico, South America, and the Caribbean. The common names are Ram goat dash along, Ram goat national, Datura flower, Mexican Holly, Stinkweed, Dather, Mad apple, Old woman's broom Turnera aphrodisiaca, and Turnera Diffusa. It is of the Turneraceae family and it is an aromatic plant with small yellow flowers that grows on dry and rocky hillsides especially in South Texas and Southern California. The most essential and used parts for medicine are the leaves. Medicinal properties are tonic, nervine, laxative, diuretic, stimulant, narcotic, anti-inflammatory, antiseptic, antidepressant as well as aphrodisiac. The constituents are tannin, resins, glycosides gonzalitosin, flavonoids, beta-sitosterol and a volatile oil which includes thymol. It was initially utilized by the Mayans to treat giddiness as well as loss of balance and this herb was traditionally used by the people of Central and South America for centuries. This medicinal plant has a strong odor similar to chamomile, due to an oil that is present in the plant. The leaves have traditionally been made into a tea and an incense which was used by native people of Central and South America for its relaxing and sedative effects. Ram goat dash along is used to treat sterility, impotence, diabetes, asthma, bladder infections and respiratory problems. Therefore, instead of using chemical medication to cure impotence and sterility, the natural alternative is the use of this medicinal plant. 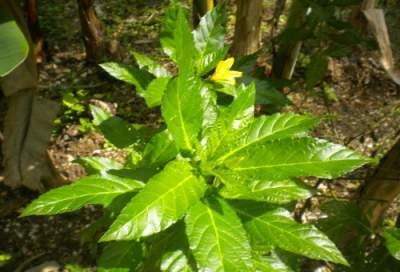 It is really the most recognized and safest medicinal herb in regards to sexual capabilities. That is why damiana is a favourite of many men because it also aids in the condition of low sperm count. This is a natural alternative to Viagra. It is excellent for both male and female, so it will enhance the reproductive system. It can be used as one of the anxiety herbs due to its natural remedy in regards to treatment of all ailments related to anxiety. It is truly an alternative medicine for nervous exhaustion, depression, nerves as well as frigidity. Other benefits of ram goat dash along includes the treatment, prostate conditions, menstruation problems and menopausal conditions. It is also excellent to treat coughs and colds as well as bronchitis in adults as well as children. It can also be used as a mild laxative for children. For damiana tea make an infusion by placing one teaspoonful of the dried herb to one cup of hot water. Then let it steep up to fifteen minutes. Then take one to two cups daily when it is cold and take it a mouthful at a time. It is an ingredient in a traditional Mexican liqueur, which is sometimes used instead of Triple Sec in margaritas. Mexican folklore claims that it was used as an ingredient in the original margarita. The margarita ingredient made up with damiana is very popular in the Los Cabos region of Mexico and is highly favored.